I've been in two minds about publishing this. I wanted to share it because of the focus on bullying throughout November but also because I thought it might be quite therapeutic to share. That said, it also makes me feel quite anxious to post. Anxious because I worry about putting too much about myself 'out there', although in that case you could ask why I'm writing a blog. Anxious in case people read and think it wasn't that bad. And anxious, just in case the people in question were to read it and somehow get in touch with me. But here goes. Growing up, we moved around quite a lot. When I was 11 during the school holidays, we moved to a new town, a few miles from the RAF base we had been living on. It was a relatively new estate with some houses still being built, owned by the Housing Association, but the houses on our road were filled. We lived at number 11 and my Mum had made friends with some of the other tenants. The lady at number 1 had 3 children, 1 of whom, K, was my age and her two boys were a couple of years older than us. K and I got on reasonably well, until a few weeks into the first year of comprehensive school when another friend of hers, M, started to hang around with us some more. I don't really remember how it all started but M took an instant dislike to me and boy did I know about it. It started with a few comments here and there and being left out of things but from Year 7 until I left in Year 11, she made my life hell, both inside and outside of school and pretty early on, K would join in. I used to have to walk past K's house to go to school. There was one occasion when eggs were thrown at me from behind the garden fence (I had to go home, wash up and get changed in a hurry so that I wasn't late for school), but otherwise it would be water or stones. I would be pushed at, spat on and pushed into. I seem to remember I was burnt with a cigarette on one occasion. Getting other children to pass on messages from M, often along the lines of 'she says you're a slag' and 'M's gonna deck you'. M would get into my face and shout abuse at me. I would be followed to and from school. 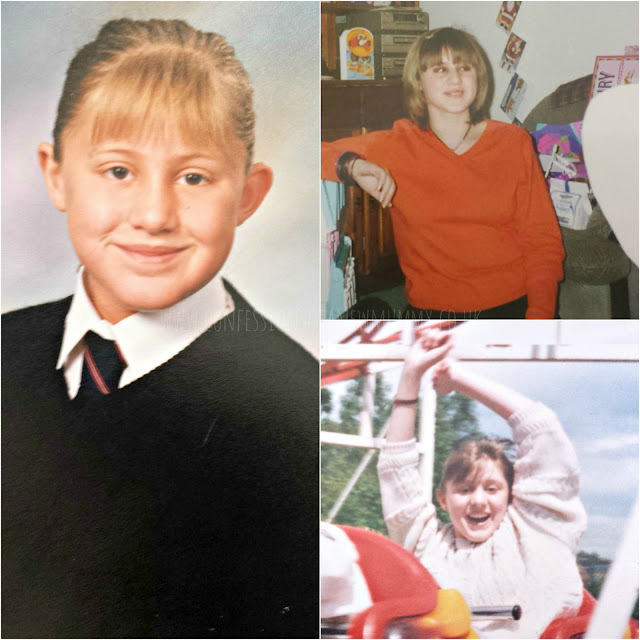 She would stand outside of school next to the bench with some of her older friends staring at me and shouting abuse before pretending she was going to follow me (she would follow me for a while and then disappear). She would get people to be friendly with me and then make them stop talking to me and blank me. I never knew where I stood with some people and if they were going to be 'proper' friends or not meaning that I would put my guard up, with some people thinking I was being standoffish. When I was at home, things would be put through the letter box and things would be thrown at the house - stones, cat poo, soil, eggs etc. M would get her older sister, L and her friends to group up and they would stand on the road opposite shouting abuse and waiting for me to leave the house. On New Year's Eve one year, they came to the house and knocked on the door. When my stepfather answered and wouldn't let her in, egged on by her friends, she pushed past to get into the house. He lifted her up and put her back outside. Nothing further happened and despite the Police being involved, no further action was taken. She gave me hell back at school though. Outside of school, if I made plans to go anywhere and M got wind of them, she would turn up and try to fight me. I always managed to get away but I used to hate going out anywhere. There was one occasion that my friend and I were in the local shopping centre using the photo booth. As we were waiting for the photos to print she spotted my friend and not me - I lived close by so managed to run home before she saw me, with my friend following shortly after. There was also the occasion I went bowling with a boy I had a major crush on, and his friends, when she turned up and tried to fight me, leaving me to run off. Throughout the time she was bullying me she was excluded on numerous occasions but for whatever reason they wouldn't expel her. The school were absolutely useless at dealing with the issue despite my Mum and Stepfather going up there several times with one of the heads of year even telling me I should stand in front of the mirror and smile at myself ten times first thing in the morning to make myself feel better. Its not rocket science to know what would have made me feel better - the bullying to stop! In the end, the Police were involved. No formal action was ever taken against her although she was spoken to on several occasions. I was advised to keep a notebook with dates and times of incidents along with as many details as I could remember - essentially what happened and who else was present. Fast forward several years later, in my early 20s, I was still living with my Mum and we had moved to another town, again not far from the previous. Of all the places, I kept bumping into M in the street. Sometimes she would say hello and be quite pleasant and other times she would shout abuse. Even then it would completely throw me. It never occurred to me to ask what her problem was, I just wanted to get away from her. Curiosity got the better of me and I looked her up on Facebook a few years ago and discovered she had a little boy and had also taken in her sister's little girl, so she's obviously grown up somewhat since. And who knows, perhaps she's actually nice now! For whatever reason, she obviously took an instant dislike to me, even now I still don't know why exactly - I wish I did. I remember that people, teachers in particular, used to be very surprised when they found out I was being bullied because they thought I was too confident and sure of myself for that. Perhaps that was the reason? The emotions that go with being bullied never leave you. Regardless of the reasons for it, bullying takes its toll even all these years down the line. The worry that someone who you have befriended and get on well with might stop talking to you and slag you off behind your back to other people. The worry of being followed and wondering which way to go so that they don't follow you home. They lesson as time goes on, but they are always there in the back of your mind. That noise outside, is it someone throwing stuff at the house or is it my imagination? It makes you doubt yourself and lowers your self esteem. You find it harder to make friends and to maintain friendships, not wanting to open up too much in case it gets used against you. One of my biggest fears with the girls going to school is that they will be bullied or even become bullies (although I don't think that will be the case but you just never know how things will turn out) particularly with the use of social media and smart phones. If these had existed when I was at school, I don't know that I would have made it through. It was tough and there were many a time I had dark thoughts. If you or someone you know are being bullied, regardless of your age there are many resources out there to help. Anti-Bullying Week 2015 runs 16th-20th November, organised by the Anti-Bullying Alliance, the theme is make a noise about bullying and is worth looking at. Follow events with #antibullyingweek on social media. It is so important to remember that it isn't your fault. Their behaviour and the way they are treating you says for more about them than it does you. If there was anything I could tell my younger self - you will get through it and years down the line, despite everything that has been thrown at you, you're stronger than you could ever imagine. I was bullied all through school. It was awful but at least when I got home I was away from the bullies. It sounds like you went through hell not being able to get away from her. Oh Kate fair play to you for publishing it I know exactly how you feel about 'putting it out there'. I too was bullied by a group of girls in my early teens in school, god they made my life hell. Brilliant summary, it's never your fault!! You Go Girl! I experienced serious bullying similqr to yours and it is awful. It really did affect my life and my confidence and self esteem! I am all for anti-bullying. This is a fab post. Thanks for rising awareness! Thanks Lisa, she certainly had issues that I knew of and haven't gone into here. That said, lots of people have issues and 'behave'. There certainly seems to be more help now. My goodness, Kate, reading your story left me traumatised, I can only imagine how it must have felt like, all these years for you! It is a disgrace that neither the police nor the school did anything to put a stop to it, especially since it seems to have affected your family as a whole, not only you! You are very good to find excuses for her. I do not think that sort of behaviour is ever excusable and I hope her inability to empathise with another human being will not affect the children who are in her care. I am so sorry you had to experience this. Thank you for your strength in speaking out. We need to have awareness. I wasn't bullied, but one of my boys was. It was so difficult to watch, try to help, but feel totally helpless at times. We need to start breaking this by starting with ourselves and being kind and teaching our kids to be kind. I can't imagine how difficult that would have been to see your child being bullied. I hope it was resolved. You're quite right that we need to teach our children to be kind, I can only hope I'm doing this with my girls. Very brave of you to share such a horrible experience you went through. Think it's fabulous that you are writing about it and raising awareness as I am a big believer in anti-bullying having been at the hand of a bully myself. Thank you. Sorry to hear you've experienced it too.